Department of Art | The FSU Department of Art announces today that the deadline for MFA applications has been extended to February 1, 2016! Home » News » The FSU Department of Art announces today that the deadline for MFA applications has been extended to February 1, 2016! 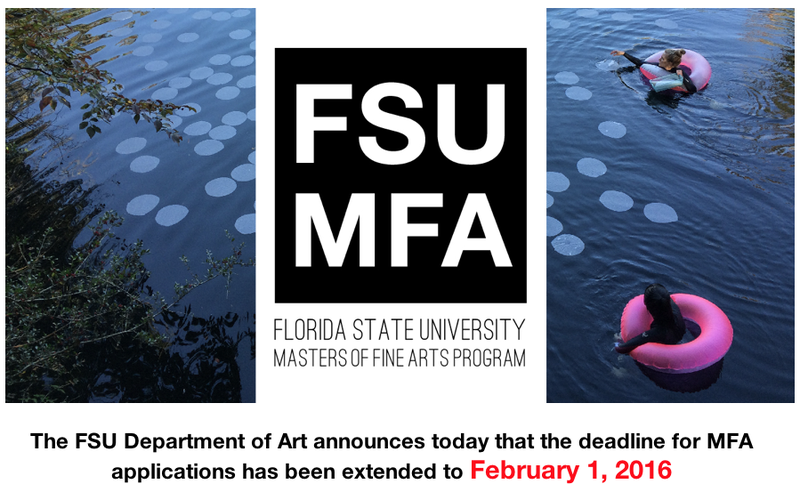 The FSU Department of Art announces today that the deadline for MFA applications has been extended to February 1, 2016! We understand that the original deadline of January 5 was impractical for many prospective applicants because the university was closed for the two weeks leading up to the deadline. Some applicants were therefore unable to get answers to critical questions. We are extending the deadline in recognition that the holidays created an unnecessary obstacle to some who wished to apply. We, however, continue to encourage applicants to apply by January 10 at the latest for consideration for the full range of scholarship opportunities at FSU.